As I listen to the guide explaining the history of the vast medieval building and its treasures, I wonder about the hundreds – possibly thousands – of servants who must have toiled here over the years. The focus of the tour is on the architecture, the works of art and the story of the nobles who have lived here. But there’s no mention of the legions of people who would have been needed to run such a place in pre-industrial times. I’m at Knole, an enormous structure which was originally built as the Archbishop of Canterbury’s private palace in the fifteenth century. 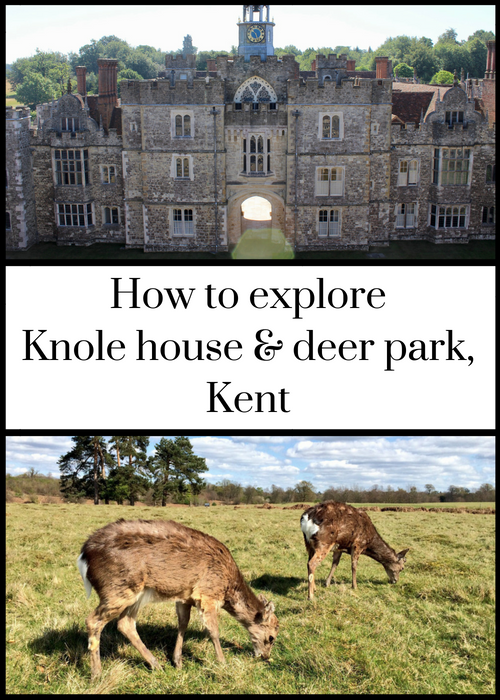 Knole house stands on five acres of ground and is said to have 365 rooms (but nobody knows for sure how many rooms there are here). The house sits in a peaceful deer park in the Kent town of Sevenoaks, in South East England. At one time the estate was the property of King Henry VIII. It then passed to the Sackville family, and some of their descendants still live at Knowle today in private apartments. The more formal part of the house is now run by the National Trust and is open to the public to visit. My group tour of the grand showrooms is led by a very knowledgable volunteer guide. 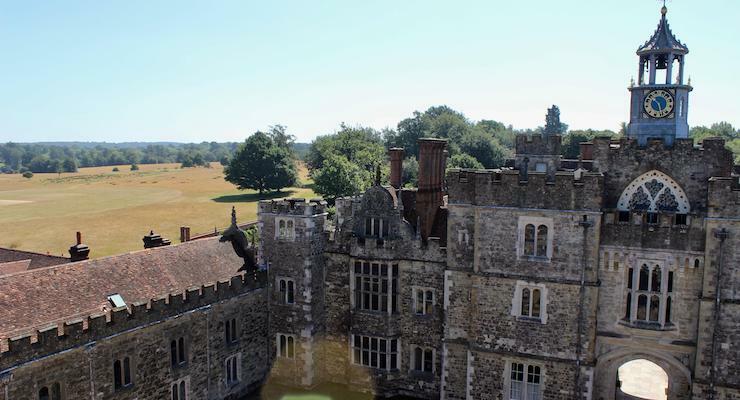 We start in the stone courtyard at the heart of the buildings, from where he leads us into the Great Hall, up a wide staircase and through some of Knole’s formal rooms. We see paintings by Gainsborough and Reynolds, as well as some 17th century copies of cartoons by Raphael. There are carvings of mermaids and mermen in the ballroom and images of leopards (symbol of the Sackvilles) all over the place. An ornate 17th century bed which was made for King James II is protected by a glass viewing area. At the end of the hour-long tour I ask the guide if it’s possible to see the kitchens, as I find it very interesting to explore those rooms when visiting historic houses. He tells me that there is nothing left of the kitchens – they are just empty rooms. The Gatehouse Tower is where Edward Sackville-West, fifth Baron Sackville, (known as Eddy) lived until 1940. 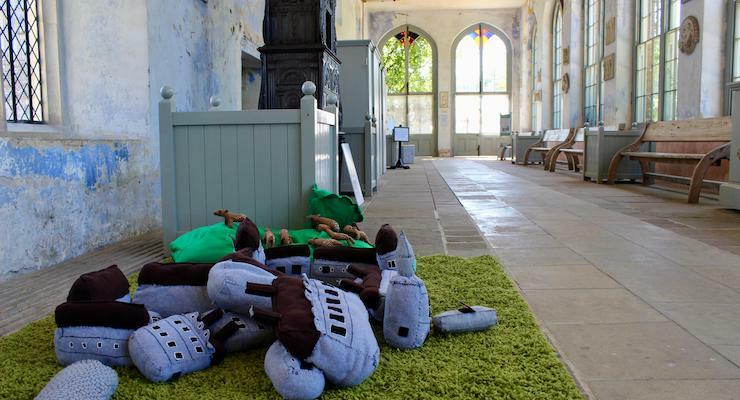 The rooms in the tower are now displayed as they would have been during Eddy’s time. Eddy was a first cousin of author Vita Sackville-West and he inherited Knowle because Vita, who grew up here and whose father was the third Baron Sackville, was female. The panoramic views across the estate from the top of the tower are definitely worth climbing the winding stone staircase for. I enjoy exploring the faded grandeur and peeling layers of paintwork of the orangery at Knole. The nineteenth century structure is home to a quirky selection of fascinating objects. Apparently the orangery was used as a store room in the twentieth century, and to me it feels like a cross between an enormous conservatory and a garden shed. There’s a huge ornate stove halfway along one wall, there are some soft toy versions of Knowle on a mat on the floor and what is described as ‘A Varied Collection of Plaques’ is dotted around the walls. (A helpful notice explains that the plaques ‘were probably collected in Europe when young Sackville gentlemen went on the Grand Tour’). It all feels a bit random, but also beautiful, and I have the whole quirky place to myself on my Saturday morning visit. 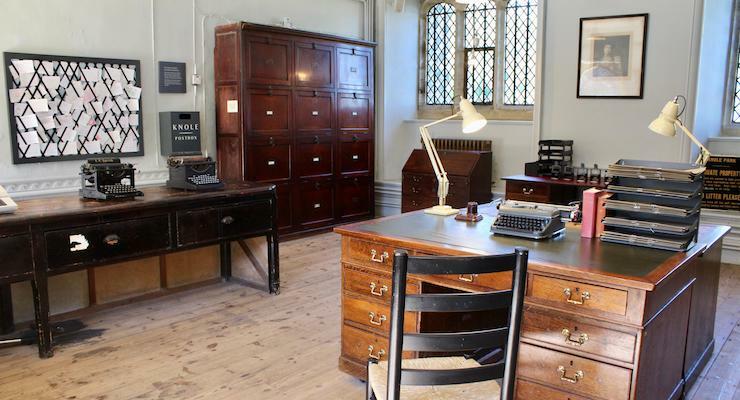 I find the former Estate Office the most interesting room to visit at Knole – although it’s not even mentioned in the National Trust Knole leaflet which I’m given at the Ticket Office. The room contains vintage typewriters and office cabinets. Inside the room you can hear voice recordings of interviews with people who used to work at Knole. On a desk at the centre of the room are typewritten notes with memories of some of the staff who worked here. I catch my breath as I read of a woman who started work here as a six year old and went on to become a cook. I want to know more about her life but there’s not much to read. In a medieval barn at the side of the main buildings is a conservation studio. You can go inside the studio and see the conservators at work on historical artefacts and artworks from Knole and from elsewhere, and learn about the techniques which they use and the issues which they face in restoring and preserving these pieces. There’s a National Trust cafe next to the studio. The deer park which surrounds the house is a vast and magnificent place which is ideal for walks, picnics and wildlife-spotting. It covers 1,000 acres and is home to around 350 wild deer, which are descended from those introduced here more than 500 years ago. It’s a peaceful and relaxing place to walk and you can go there even if you’re not visiting the house (although dogs must be kept on leads in the park, I assume because of the deer). 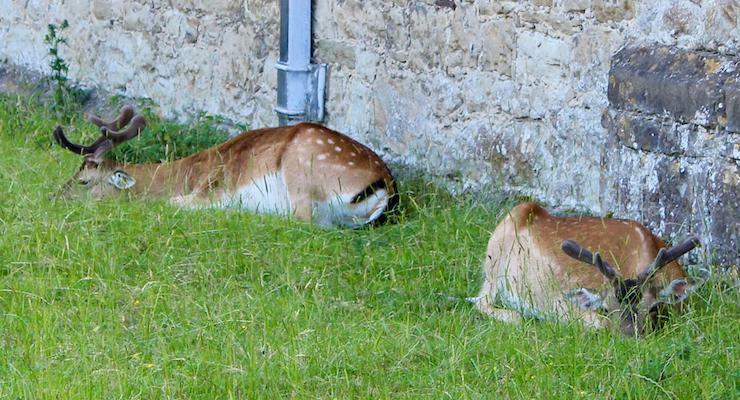 I love exploring the deer park at Knole. It’s interesting to visit the rooms at the house and to learn about its history. It would be fascinating to learn more about the lives and experiences of the legions of ordinary people who worked here over the centuries, and I wish that they were more represented in the National Trust displays. I have visited Knole a few times -one memorable visit was on a very cold day in April a few years ago. The house was so unbearably cold we rushed round and got out as quick as we could. I agree the National Trust are missing a trick here by not showing the kitchens or any other part of the house where ordinary people worked. Did you see the painting of the Spanish Lady? 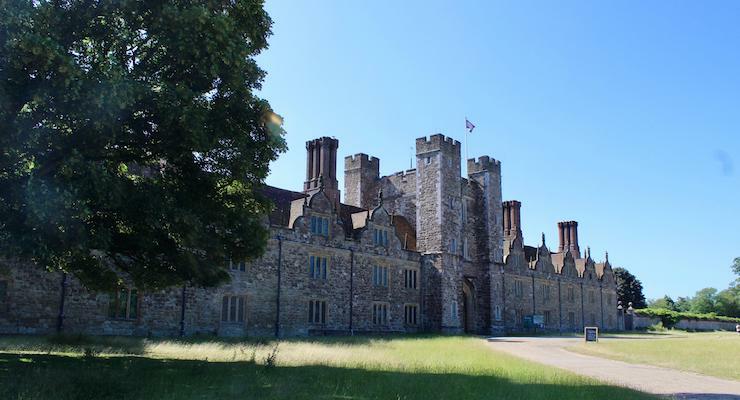 All the other parts of Knole are very interesting though. I don’t remember seeing that painting – I liked the Raphael cartoons though.